Many suppliers in the events and exhibitions industry have reported a similar issue - their customer will go into the hotel or whatever space they want to stage their event, and they don’t like the room’s decor. It’s easy enough to cover wallpaper with drapes, but what about the hideous floral carpet? 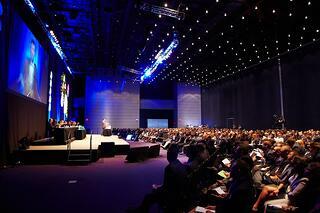 Event flooring contractors and other industry professionals have historically had trouble laying flooring over carpet. The top flooring would move throughout the event, creating wrinkles and bubbles that aren’t only unattractive, but can also be serious trip hazards. The problem is that all carpet has a pile direction, meaning the carpet’s fibers lean to a certain angle. When a floor covering is put on top of it, it compresses the fibers as people stand or walk on it. When they step off, the carpet will shift in the direction of the fibers and move the covering. By the end of a long day or week of events, the floor covering will have moved considerably in one direction. Vinyl flooring is growing in popularity because of the smooth, clean look it gives the event space. It’s also easy to clean since it’s moppable, so it can be reused more often than a carpet. Vinyl presents its own set of problems because of its linear expansivity. This means that it expands and contracts with temperature changes, creating ripples and trip hazards. Typically, vinyl event flooring looks great right after it’s been installed. But, once delegates start entering the room, the space heats up. Then, event coordinators may lower the air conditioning temperature to keep everyone comfortable. These constant changes create problems, which is why vinyl flooring needs to be installed with a full coverage system. Obviously, wet glue would hold the event flooring securely, but that’s not a reasonable solution. Not only would it take hours of labor and curing time, it would damage the hotel carpet that’s likely to be a very high-end, quality carpet that costs many times more than the event flooring that would go on top. Another option is double-sided tape, but that’s also not ideal because it isn’t full coverage. If these two installation methods won’t work, what will? 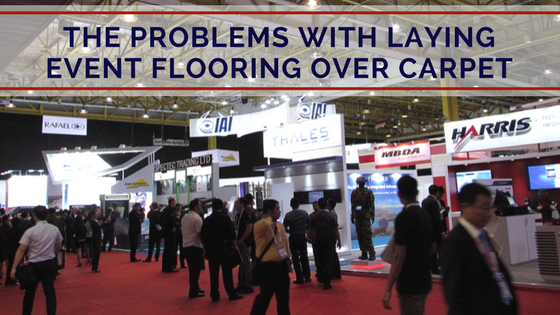 Several strategies have been used to try to solve the problem of laying event floor coverings over carpet. Polythene Membrane Over Carpet - An Alternative? One option used for carpet over carpet is a polythene membrane. It’s laid over the carpet so that the polythene would be shifted instead of the actual carpet fibers. But, the polythene eventually gathers around the room and creates ripples everywhere. This isn’t a good solution. Another option is to lay plywood over the entire area, then lay carpet or other event flooring on top of the boards. This is an effective solution, but involves significant costs. First, it requires a team of carpenters to come in and lay sheets of plywood. Plus, customers will have to pay for the plywood and whatever glue or other adhesive will be used to secure the flooring to the plywood. It also takes a long time to install because of the additional step of laying the plywood boards, and the time it will take for the glue to dry. The plywood installation technique is effective, but has its shortcomings. A third option for event flooring is using a dry, pressure-sensitive adhesive like the product we manufacture, Lok-Lift. Lok-Lift is full coverage, so it is effective for both carpet over carpet and vinyl over carpet. It can be put directly onto the original flooring, then the event flooring is laid on top of it. As a full coverage adhesive, Lok-Lift gives the same effect as a wet glue without the mess, curing time, and hazardous fumes. The process is quick and cost-effective, too - customers have reported that it takes roughly a third of the time of a plywood installation, without requiring carpentry or additional labor. One of its greatest advantages is that it is easily removed. All you have to do is pull it 90 degrees from the actual floor, perpendicularly, and it will come away very easily. If it’s pulled in any other direction, it won’t budge. Best of all, the carpet below will be undamaged, in its original condition. 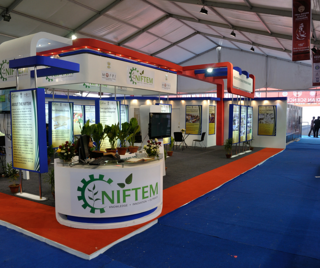 If you’d like to learn more about Lok-Lift or other options for event and exhibition flooring, please consult with one of our product specialists.